When you are ready to make a data source available to other Tableau Desktop users, you can publish it to Tableau Server or Tableau Online. If the data source is in a workbook that you published to Tableau Server or Tableau Online, you can make it available by saving it, provided it’s an embedded Excel or text file. For details, see Save a Data Source on the Web. Note: If you haven't yet read about best practices for creating data sources and when to create an extract, see Best Practices for Published Data Sources. The following steps give an overview of the publishing flow you will use regardless of the type of data or the server you publish to. 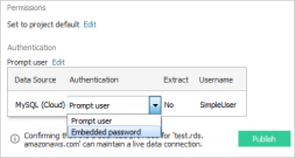 Below these steps you can find supplemental information for authentication types and using the Tableau Bridge to refresh extracts of local data sources. Select Server > Publish Data Source. 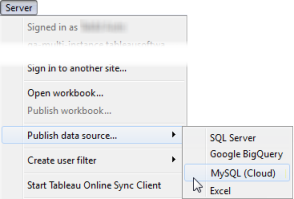 If your workbook is connected to multiple data sources, select the one you want from the submenu. If you’re not already signed in to Tableau Server or Tableau Online, sign in now. How you sign in depends on how your administrator set up your environment. For information, see Sign in to Tableau Server or Online. Select the project you want to publish to and enter the data source name. Add a description and tags that will help you and other users find it. Separate tags using either a comma or a space. To add a tag that contains a space, put it in quotation marks (e.g., “Sales Quotes”). For Permissions, accept the default project settings. Generally a site administrator manages permissions on the server. If you think your data source is an exception, work with your administrator to determine the best course of action, and see Set Permissions as You Publish a Data Source or Workbook. For Authentication, if you need to provide credentials to access your data, you can specify how authentication should be handled when the data is published to the server. The options available for accessing the data source depend on the type of data you publish and whether you are publishing to Tableau Server or Tableau Online. Information appears at the bottom of the dialog box to let you know whether you need to take further action, such as adding Tableau Online to your data provider's authorized list. For information about the authentication types, see Set Credentials for Accessing Your Published Data. If you are publishing file-based data that is on a Windows mapped drive, or using images that will not be available from the server, select Include external files. If you do not want to publish the external files to the server, change the connection information so that the data source references a full UNC path. For example, rather than connecting to D:\datasource.xls, you would connect to \\filesrv\datasource.xls. By default, during the publishing process, Tableau updates the workbook connection to use the new published data source. It also closes the local data source. To continue using the local data source instead, clear the Update workbook to use the published data source check box. After publishing is complete, your web browser opens Ask Data for the data source, where you can ask questions to automatically create vizzes. For more information, see Automatically Build Views with Ask Data. If you use Tableau Online, Tableau Bridge is required for live connections to on-premises data or extracts of data sources that Tableau Online can't reach directly. To publish a web data connector data source, you need to import the web data connector to the server before you can set up a refresh schedule. You can do this only on Tableau Server. You can refresh some web data connector data sources on Tableau Online, using Tableau Bridge. For information, see Web Data Connectors in Tableau Server in the Tableau Server Help or Use Tableau Bridge to Expand Data Freshness Options in the Tableau Online Help. Workbooks connected to a published data source respect the state of hidden fields in the published the data source. If you create a new workbook that uses a published data source with hidden fields, those fields remain hidden in the workbook and cannot be used in calculations, sets, groups, and other object creation. If you work with an existing workbook that uses a published data source with hidden fields, those hidden fields are displayed in red in the workbook to indicate that the fields, and therefore the views and calculations that use those fields, are invalid. Show (unhide) the relevant fields in the data source, and then republish the data source. Update the relevant workbooks to exclude the hidden fields. For information, see Hide or Unhide Fields.